LAVA International Limited, a leading Indian multi-national company in the mobile handset industry, marked a significant milestone for the country - by launching India’s first ‘Design in India’ initiative and India’s first ‘Designed in India’ mobile phone. 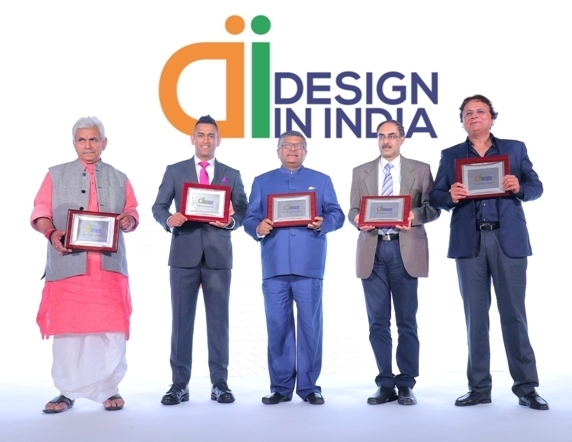 The ‘Design in India’ initiative was launched today, in New Delhi, by Shri Ravi Shankar Prasad, Hon’ble Minister of Law & Justice and Information Technology, Government of India, Shri Manoj Sinha, Hon'ble Minister of State for Communications (Independent Charge) and Minister of State for Railways, Government of India, Mr. Mahendra Singh Dhoni, Cricketer and Former Captain, Indian National Cricket Team and Mr. Hari Om Rai, Chairman & Managing Director, LAVA International Limited. Unveiling the Design in India initiative, Shri Ravi Shankar Prasad, Hon’ble Minister of Law & Justice and Information Technology, Government of India said “Our government has put in place policies and structures to fulfill our commitment to make India a global hub of electronics manufacturing which has led to setting up of 108 mobile manufacturing units in last three years. ‘Design in India’ is a key milestone in that direction and I congratulate LAVA on taking the lead to take this initiative forward”. Shri Manoj Sinha, Hon'ble Minister of State for Communications (Independent Charge) and Minister of State for Railways, Government of India commented “Our vision is to create 100 million jobs by 2022. Initiatives like ‘Make in India’ and ‘Design in India’ will play a vital role in creating jobs for a young and large country like ours, not just for today; but for our future generations as well. I congratulate LAVA for taking a lead in designing the mobile phones in the country and launching the first ‘Designed in India’ mobile phone”. Speaking on the occasion, Mr. Hari Om Rai, Chairman & Managing Director, LAVA International said “The Design in India initiative is one of the most significant milestones towards achieving our country’s vision of making India a global hub for mobile phone manufacturing. ‘Design in India’ is a critical step towards building the mobile components and parts eco-system in the country. Over the last six years, LAVA has built its capability and expertise in mobile design which led to ‘Design in India’. Having said that, I am very proud of our Indian engineers who have not just built India’s first ‘Designed in India’ mobile phone but one which is a true hallmark of excellence”. Priced at Rs. 1499, PRIME X is the slimmest phone in its category yet, with an incredible battery standby time of 17 days. PRIME X exemplifies LAVA’s value proposition ofreliability by outperforming all the competing products in its category. It has best-in-class audio, giving its users an immersive audio performance. The phone also comes with a 2-year replacement warranty, thereby demonstrating the confidence LAVA has in its product quality, which is backed by robust investments in Research & Development and Product Manufacturing. In 2016, LAVA set up its Design Centre in Noida, India, with a large team of Indian designers and engineers. The design team spent over a year in China getting trained and guided by the company’s China team on Industrial, Mechanical, Hardware and Software Design. LAVA has a large in-house Research & Development Centre in Shenzhen, China with an over 700-member strong team of engineers, covering the entire gamut of mobile design. Having complete control on the Mobile Design, Components Supply Chain and Manufacturing enables LAVA to remain true to its Brand promise of ‘Never Lets You Down’. Going forward, the company is aiming at launching the first ‘Designed in India’ Smartphone by October, 2018. Furthermore, the company is working towards designing and manufacturing the entire range of LAVA mobiles in India by 2021.